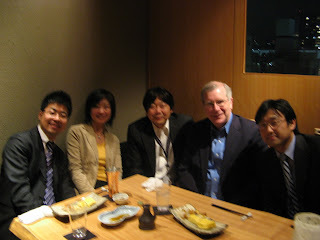 I had a nice dinner with colleagues from the FH Tokyo office. Delightful evening. Went to an “out of the way” little restaurant that is the favorite of our general manager, Shin Tanaka (seated next to me). Stick to your ribs, homemade Japanese food, many courses. The work ethic here is astounding. The two men pictured below at the ends (Hiro on left and Ko on the right), left the dinner at 10 pm, went back to the office and worked all night, rejoining us for meetings the next morning. Explains why I didn’t get much sympathy over my whining about my jet lag and restless sleep.